The Willem Kleine Schaars Model, what does it stand for? Willem Kleine Schaars has lifelong experience in working with people with intellectual disabilities, psychiatry and care for the elderly, in different capacities. He noticed that people who became more dependent on others, increasingly lost direction over their own lives. 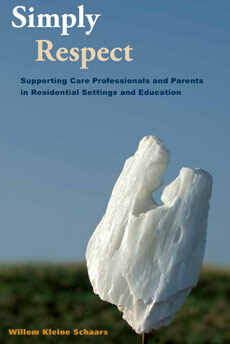 Too often, people in their environment (professional carers and others), took over and made decisions for them. In his practice Willem has developed a method, whereby every person, no matter what his limitations are, can determine his own life. Selfdetermination within one’s own limitations is the starting point. This method has been called: The Willem Kleine Schaars Model. This Model is explained completely in his latest book: ‘Simply Respect’. After publishing two previous books, Willem started to coach teams and organisations to practice the Model. He gives workshops, seminars and training in The Netherlands, Belgium, Germany, Switzerland and Austria. The main focus is on clients and the co-operation within the organisation. Willem and his co-workers also train coaches who support teams starting and/or practicing the WKS Model within their own organisation. ‘Simply Respect’ and the two previous books have also been translated in German. The development of this model had surprising consequences for clients in practice. People who never thought to be able to make their own choices, are actually doing it. Clients will support one another as long as support people get out of their way. Behaviour that was never understood, all of a sudden becomes well understood. Supports people may discover things they never did see before through observation and active listening to clients. When care givers move to the back ground, or even disappear completely, people in need of care may take initiative, one could never imagine. The space someone needs is different for each person. Willem uses the idea of a framework. More able bodies have bigger frame works, than people with more limited abilities. The supports people define the frame works.